Itsukushima Torii the gate to the Shinto shrine on the island of Itsukushima (also known as Miyajima), the island is one of Hayashi Gahō's Three Views of Japan, Japan's three most celebrated scenic sights. Destination Japan, a country in eastern Asia that occupies a chain of islands in the Pacific Ocean roughly parallel with the eastern coast of the Asia's mainland. 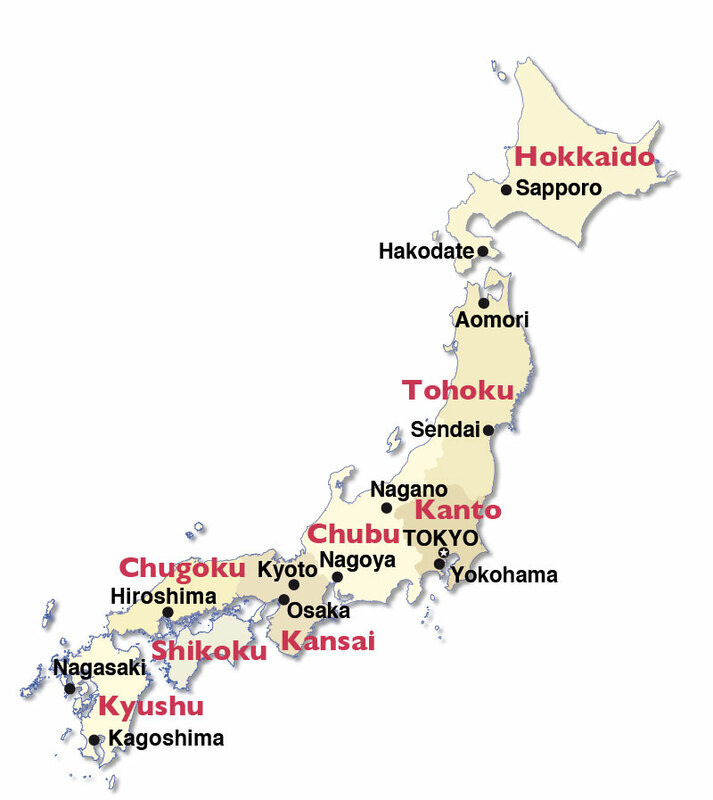 Japan's main islands are (from north to south) Hokkaido, Honshu, Shikoku and Kyushu. The country shares maritime borders with China, North Korea, South Korea, the Philippines, Russia and Taiwan. The island nation covers an area of 377,915 km², scattered over 6000 islands, making it somewhat larger than Germany or slightly smaller than the US state of California. Japan has a slowly shrinking population of 126.9 million inhabitants (in 2016). The national capital and largest city is Tokyo. Other major cities are Fukuoka, Fukushima, Kobe, Kyoto, Nagoya, Osaka, Sapporo, Sendai, and Yokohama. Official languages is Japanese. Kobe, Kyoto, Osaka, Sendai, Yokohama. Type: Constitutional monarchy with a parliamentary government. Location: Eastern Asia, island chain between the North Pacific Ocean and the Sea of Japan (East Sea), east of the Korean Peninsula. Climate: Varies from subtropical to temperate. Natural resources: Negligible mineral resources, fish. Agriculture products: Rice, sugar beets, vegetables, fruit, pork, poultry, dairy products, eggs, fish. Industries: Among world's largest and technologically advanced producers of motor vehicles, electronic equipment, machine tools, steel and nonferrous metals, ships, chemicals, textiles, processed foods. While retaining its time-honored culture, Japan rapidly absorbed Western technology during the late 19th and early 20th centuries. After its devastating defeat in World War II, Japan recovered to become the third most powerful economy in the world and a staunch ally of the US. While the emperor retains his throne as a symbol of national unity, actual power rests in networks of powerful politicians, bureaucrats, and business executives. The economy experienced a major slowdown in the 1990s following three decades of unprecedented growth. Japan's National Diet Building in Nagatachō, Tokyo. The building is the meetingplace of both houses of the national parliament of Japan, the country's bicameral legislature. Japan is a constitutional monarchy but the power of the Emperor (Tennō) is very limited. According to the constitution of 1947, Japan is also a parliamentary democracy. Ceremonial head of state is the emperor, he appoints the Prime Minister, the head of government of Japan. 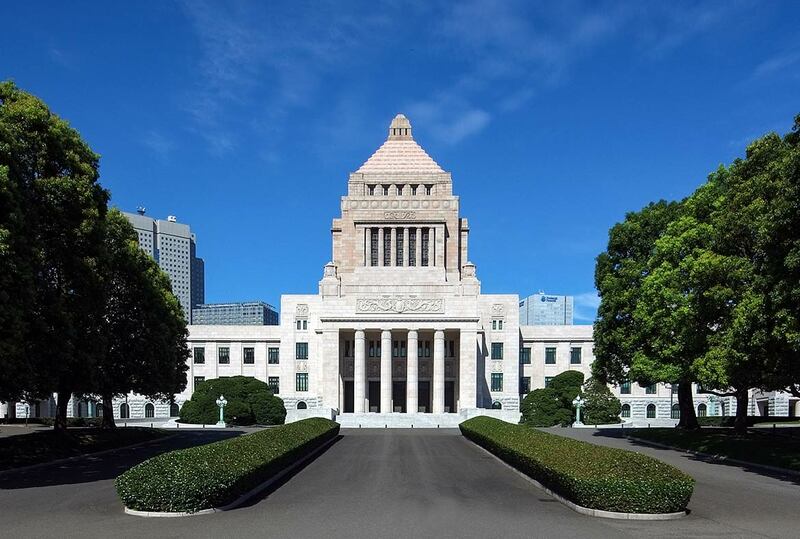 The legislature consists of a two-chamber parliament (National Diet), the Shugiin (the House of Representatives), is the lower house, re-elected every four years, and the Sangiin (the House of Councilors), the upper house of the National Diet, its members all serve six-year terms. Introduction to the official duties and various public activities of Their Majesties the Emperor and Empress, and other members of the Imperial Family. Official website of the Prime Minister of Japan and his Cabinet. Ministry of Foreign Affairs of Japan. Japan's representation to the UN. Embassy of Japan in the United States of America, Washington D.C.
Websites of Japan Embassies and Consulates around the world. Embassies, Consulates and International Organizations in Japan. Information on visa requirements to enter Japan. Searchable satellite view and map of Japan. Searchable satellite view and map of Tokyo. English-language daily newspaper, based in Minato, Tokyo. A leading source of Japan News in English. National newspaper with Japanese and international news. Summary of Japan related news from various sources. 'Japan Economics Newspaper', the world's largest financial newspaper. Nikkei also publishes the Nikkei Asian Review, an English-language business journal. Daily Japanese newspaper. It also publishes Japan Forward, an English-language news and opinion website. One of Japan's five National newspapers. The Yomiuri Shimbun English edition (The Japan News). There's more than just sushi. Dive deeper into Japan, weekly updated photo features on Japan and the Japanese, news, information, book & music reviews. Photos of Japanese Street Fashion, fashion trends of Japan's trendy youths. Page about the first virtual cybergirl. Japan-based international online magazine features creative culture. Japanese fashion, Style Icons and Tokyo street style. The National Museum of Modern Art, Kyoto (MOMAK) was established in 1963 as The Annex Museum of The National Museum of Modern Art in Tokyo. The National Museum of Modern Art, Tokyo (MOMAT) consists of the main building and the Crafts Gallery in Kitanomaru Park near the Imperial Palace, and the National Film Center in Kyobashi near Ginza. Contemporary art museum in Roppongi Hills, Tokyo. The Kyoto National Museum was established as a National institution for the collection and preservation of cultural properties. The National Museum of Ethnology - Information on people, societies and cultures throughout of the world. The museum shows more than 10.000 items of species including a variety of animals, plants, insects, it also maintains a flower, greenery and nature information center. The museum collects, houses, and displays a comprehensive collection of art works and antiquities from Japan as well as from other Asian countries. Wikipedia entry about the phenomenon of Japanese pop music. Japanese Music: Top 100 Songs Charts. Influential Japanese electronic music band. All things anime, and manga. The first Manga magazine in the world on the web. Egg-shaped mini computer and one of the biggest toy fads of the 1990s. Beagle-like robotic pets designed and manufactured by Sony. The production of the AIBO is now discontinued, you can not buy any new ones. Short for Pocket Monsters, fictional creatures called "Pokémon", which humans, known as Pokémon Trainers, catch and train to battle each other for sport. Martial art, the 'gentle way' was created in 1882, by Japanese educator and athlete Kanō Jigorō. Japanese martial art, using an attacker's energy against him. The Art of the Sword - Martial Art. The site referes to pictures of beautiful women in Japanese art - Bijinga. The Way of Tea - The Urasenke Tradition of Tea. The ritualized preparation and serving of powdered green tea in the presence of guests. The Art of Flower Arrangement. Japanese gardens around the world. Japanese myths site by Shimane Prefecture. Kabuki-za in Ginza district of Chūō, Tokyo, is the principal theater in Tokyo for the traditional kabuki drama form. An illustrated manuscript of Japanese classical play Kabuki. Kimono, meaning clothing in Japanese, a easy to read site about Japan's traditional high maintenance clothing. An Introduction to Tea Ceremony by Head Tea Master of Ogasawara Sencha Service School. The Japanese sword (日本刀 nihontō), English Wikipedia article about the traditional Samurai swords and fittings. The mountain village in Shirakawa-go, Gifu Pref. with traditional wooden houses is a world heritage site. Wikipedia article about Shogi, a Japanese board game comparable with chess. History and Culture of Wajima-Nuri, the traditional Japanese lacquerware. 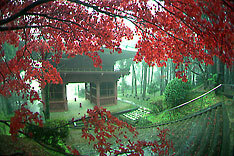 Established to promote basic research on Zen Buddhism. From silk, the aristocratic fiber to paper and porcelain. A virtual museum by the Japanese the Ministry of Foreign Affairs. Central Bank Japan. The Japanese central bank is a legal person and not a government agency or a private corporation. Index of the Japanese stock market. Financial services corporation that operates the exchanges of Tokyo Stock Exchange and Osaka Securities Exchange. JCCI is a network of local economic organizations made up of the representatives of some 1.26 million member businesses nationwide. The TCCI is a economic organization, founded in 1878, the chamber represents the commercial and industrial interests of businesses of the 23-ward area of metropolitan Tokyo. JETRO is a Japanese government-related organization that promotes mutually beneficial trade and investment relations between Japan and other nations. Japan's automotive industry is one of the largest industries in the world. Japan was among the three countries with the highest production of cars since the 1960s, surpassing Germany. Japan was the pioneer in robotics manufacturing of cars starting in the late 1970s. Japanese automobile manufacturer of small cars, the company was founded in 1907. The company is now a subsidiary of Toyota. Japanese multinational manufacturer of automobiles, aircrafts, and motorcycles, with its headquarters at Minato, Tokyo. A Japanese manufacturing company for commercial vehicles and diesel engines, headquartered in Tokyo. Kawasaki Heavy Industries is outside Japan best known as a manufacturer of motorcycles. Japanese automobile manufacturer based in Aki District, Hiroshima Prefecture. One of the three major heavy industrial manufacturers in Japan is also a manufacturer of cars, the company is based in Tokyo. Japanese multinational automaker headquartered in Nishi-ku, Yokohama. By now, it is the world's largest manufacturer of electric vehicles. The automotive division of Fuji Heavy Industries (FHI), it is the largest manufacturer of all-wheel drive passenger cars. Its headquarters are in Ebisu, Shibuya, Tokyo. Japanese manufacturer of motorcycles, cars and outboard motors with its headquarters at Hamamatsu, Shizuoka Prefecture. Japanese multinational company and the world's largest automotive manufacturer, headquartered in Toyota, Aichi, Japan. Lexus is the luxury vehicle division of Toyota. Japanese multinational manufacturer of motorcycles, power sports equipment, musical instruments, and electronics. Beauty and Health made in Japan. French luxury house founded in 1970 by Japanese designer Kenzo Takada. The Japanese answer to CHANEL & Co.
Japanese casual wear designer, manufacturer and retailer. ... and more fine cameras. Toys, from the Rhythm Ball (1950) to Sailor Moon (1993), Tamagotchi (1996) and more. Formerly a Japanese card company, now a multinational manufacturer of video games and game consoles, headquartered in Kyoto. Japanese multinational electronics corporation headquartered in Kadoma, Osaka. Japanese Hifi. Japanese multinational corporation with its headquarters in Bunkyō, Tokyo. Entertainment universe. Japanese multinational video game developer headquartered in Tokyo. Japanese multinational corporation, manufacturer of a wide range of electronic consumer and business products, they are headquartered in Sakai, Osaka Prefecture. One of the largest advertising agencies in the world. There are three major heavy industrial manufacturers in Japan. IHI Corporation produces ships, aircraft engines, turbochargers for automobiles, industrial machines, space products like sounding rockets and launch vehicles, energy systems (industrial power station boilers) and other facilities. Japanese multinational corporation is a major player in the area of shipbuilding, aerospace engineering, vehicle construction (railways, construction vehicles, motorcycles), building construction and civil engineering, as well as machine and power plant construction (robots, bag conveyor systems, and gas turbines). Japanese multinational company with 300 subsidiaries, active mainly in the heavy industry, mechanical and automotive engineering, and in the aviation and electronics industry, headquartered in Tokyo. Largest Japanese airline. The Tokyo-based company is listed in the Nikkei 225, it is a member of the global airline alliance Star Alliance. The second largest Japanese airline is based in Shinagawa, one of the 23 districts of the Japanese Prefecture of Tokyo. The flag carrier airline of Japan has its main hubs at Tokyo Haneda Airport and at Tokyo Narita Airport. JAL is a member of the aviation alliance oneworld. First international low-cost carrier in Japan with its hub at Kansai International Airport, Izumisano, Osaka. The airline serves destinations within Japan, and offers flights to Hong Kong and Shanghai in China, Busan and Seoul in South Korea, Kaohsiung and Taipei in Taiwan, and Bangkok in Thailand. New Tokyo International Airport, Narita-shi, Chiba. The other one of the two primary airports that serve the Greater Tokyo Area, located in Ōta, Tokyo. Osaka's international airport is located about 50 km (by road) south of the city on an artificial island in Osaka Bay. Chubu Centrair International Airport is located on an artificial island in Ise Bay, 48 km (by road) south of Nagoya. The location and information about other major Japanese airports you will find here: Fukuoka, Fukushima, Kobe, Kyoto, Nagoya, Osaka, Sapporo, Sendai, Yokohama. One of the seven successors of the Japanese National Railways. 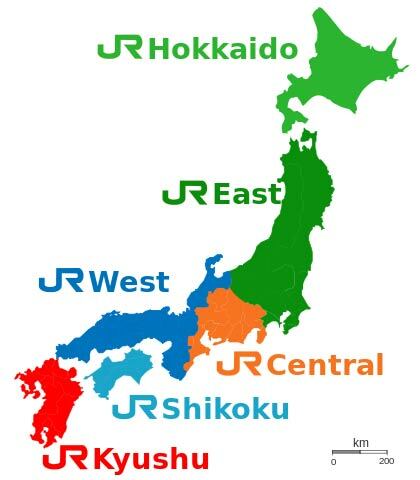 JR Hokkaido operates its route network on Hokkaido, the second largest island of Japan, and the northernmost prefecture. 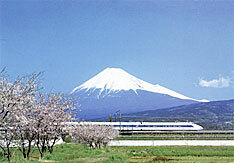 One of the six major passenger railway companies in Japan. Its route network covers the northern half of Honshu. West Japan Railway Company operates its route network in western Honshu. It has its headquarters in Kita-ku, Osaka. Railway operator and freight mover with a route network in the Chūbu region in the central area of Japan. Its headquarters are located in Nagoya, Aichi Prefecture. Japan Freight Railway Company or JR Freight, operates rail freight transport nationwide. It has its headquarters in Shibuya, Tokyo. JR Shikoku operates the former state route network on the island of Shikoku, the southern/westernmost and the smallest of the four main islands of Japan. JR Kyushu operates rail services on Kyushu island and the Beetle hydrofoil ferry service across the Tsushima Strait between Fukuoka and Busan, South Korea. Its headquarters are in Hakata-ku, Fukuoka. Odakyu Electric Railway operates limited express luxury tourist services south-west of Tokyo, to mountain resorts and beaches. 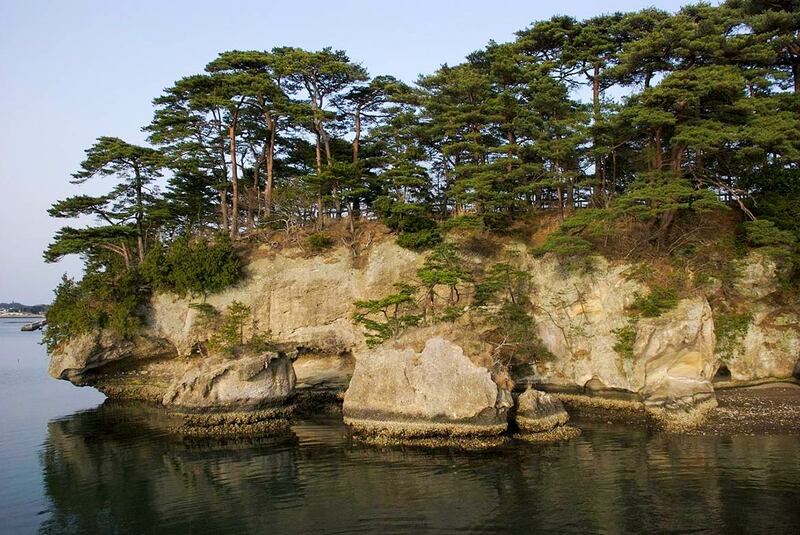 Scene from Matsushima islands in Matsushima Bay in Japan. The group of islands in Miyagi Prefecture are one of the Three Views of Japan, Japan's three most celebrated scenic sights. Travel and tourism guide on Japan, the Japanese and much much more. Official guide to Japan's northernmost prefecture by Hokkaido Tourism Organization. Explore the deep north of Japan. Official visitors guide by Tohoku Tourism Promotion Organization to Tōhoku, a region in the north of Honshu island known for its volcanoes, mountainous terrain and skiing. Official visitors guide to Central Japan by the Central Japan Tourism Promotion Association; Chubu region is the central part of Honshu island. Official visitors guides to Kansai or Kinki region in the central south of Honshu, main cities are Kyoto, Nara, Kobe, and Osaka. Official visitors guide to Hiroshima Prefecture in Chūgoku region of southern Honshu. Kyushu is Japan's third largest island, main cities are Kagoshima, Oita, Nagasaki Miyazaki, Naha, and Kurume. Official visitors guide to Shikoku one of the four main islands of Japan. Official travel and tourism information about Okinawa, the southernmost prefecture of Japan in the East China Sea between Taiwan and Japan's main islands. Japan related magazine, launched with the aim of helping people around the world get to know more about Japan and the Japanese. 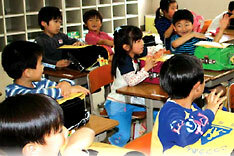 Organization for international cultural exchange in Japan. 200 pages with illustrated, general information on most aspects of modern and traditional Japan. (Or: what I wish i knew before....) The Complete Guide to Working, Visiting, and Living in Japan. Tha Japanese art to convey consideration and sympathy for others through an esthetic sense of innate and dispassionate self-control. A Guide to Photography in Japan. Travelers guide to Tokyo by the Tokyo Convention & Visitors Bureau. The Tokyo National Research Institute of Cultural Properties. More than 800 Tokyo-area restaurants. A comprehensive guide to study in Japan. National University, established in 1949. Founded as Igirisu Horitsu Gakko (The English Law School) in 1885. The former Tokyo Imperial University, first Japanese institution of higher learning, founded 1877. National Museum of Nature and Science,Tokyo. Tokyo based environmental advocacy group. The forum is engaged in a variety of activities all concerning environmental issues. List of Japanese environmental web sites. Most general facts of Japanese history. Japans official documents and records. The page deals with the military aspects of Old Japan.